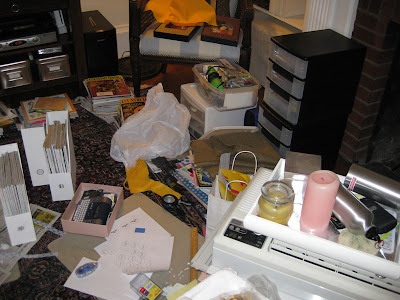 This is the current state of my family room floor...yikes! I have about 10,000 projects going on and they all seem to be going on at once. I guess getting all my magazines labeled and in chronological order was a bigger project than I thought...well a big project for this small space anyways. As you can see, I've got alot on my plate...I hope I can get it all in order soon, I'm kinda sick of looking at this disaster. On second thought, maybe its time to move to a two bedroom apartment. That way I have a place of my own for these kind of projects and even better I would have a new place to decorate!! You have just made me feel so much better about my guest room which is covered in stuff!! Thank you! haha oh gosh, that is a very daunting (but fun) list! I have a feeling our guest room/study is going to look like that soon because I'm planning on organizing our hundreds of books by color - yikes! Happy to know I am not the only one who litters my tiny space when under going one of my "projects". If someone is unfortunate enough to stop to visit during the storm, I assure them it always gets very bad before it gets really good. Organizing is a messy business. Ah ok that picture totally looks like what is going on in my head! Too much. I have so many projects going on and not enough time. I just keep thinking about it and thinking about it. Hopefully I can cross some things off this list this week. Devon- I'd love to come over and help organize, Its funny because I LOVE doing organizing other peoples stuff more than my own! 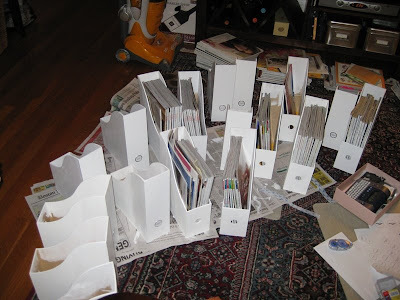 This is inspiring me to organize my magazines! I must tear out and purge... I'm not good about that. I'm only a pack rat when it comes to magazines.